Foster + Partners is designing and then erecting, with the help of the public, a special installation to mark the launch of the 2008 London Festival of Architecture (LFA) on Saturday 21 June. Part of the LFA’s Kensington, Chelsea and Knightsbridge Hub, the structure will be constructed and dismantled on Exhibition Road in a single day. The design will be revealed at the event and Foster + Partners is delighted to announce that the installation will incorporate a new eight channel site specific sound sculpture by artist Bill Fontana. This is Fontana’s second interactive piece with a Foster + Partners project – in 2006, his sound installation ‘Harmonic Bridge’ captured the reverberations of the Millennium Footbridge inside the Turbine Hall of Tate Modern. This new project will also form part of the free annual music festival along Exhibition Road, which will be pedestrianised for the day. The temporary structure will rise to over ten metres in height, feature tensile components and involve public participation. Members of the public will be invited to assist between 10.00am to 12.00pm and then help to raise the structure at 2.00pm. Situated adjacent to Imperial College, visitors will be able to experience the interior of the installation and the specially commissioned sound piece until 6.30pm. The London Festival of Architecture runs from 20 June to 20 July 2008 and has been organised around five Hubs. 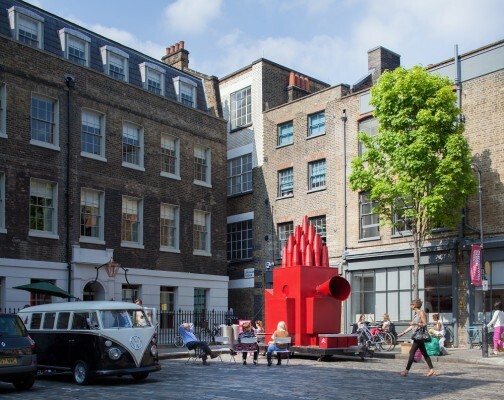 The Kensington, Chelsea and Knightsbridge Hub, co-ordinated by the RIBA Trust, is the first of these and on 21 June, Exhibition Road will be closed to traffic and become the setting for a host of outdoor events. Foster + Partners will also be collaborating with VocalEyes for the LFA, conducting tours of 30 St Mary Axe for the visually impaired. The event coincides with ‘2008 Exhibition Road Music Day’, a free music festival involving all the cultural institutions along Exhibition Road. Bill Fontana lives and works in San Francisco, exhibits internationally and is represented in London by Haunch of Venison. He has spent more than thirty years creating installations that use sound to transform the visitor’s experience of art and architecture.